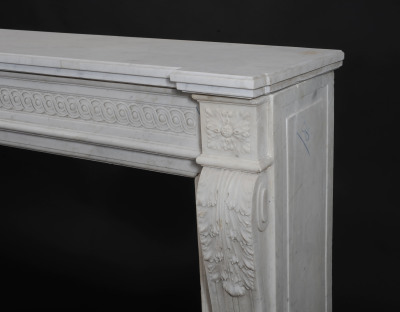 "Eternal Love, Unity and Fidelity"
An elegantly carved Louis XVI fireplace in white Carrara marble. 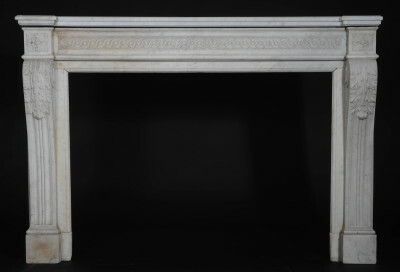 The rectangular moulded shelf sits above a panelled frieze finely decorated with an interlocking guilloche. The guilloche pattern is formed by two bands forever twisting around each other in circular courses. This ancient Greek pattern traditionally symbolizes eternal love, unity and fidelity. 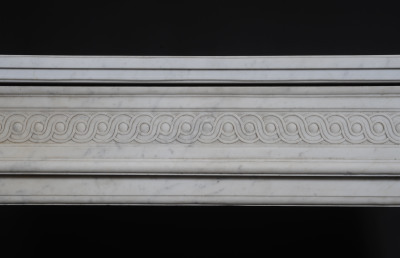 Square floral paterae sit above beautifully carved acanthus leaves on scrolled jambs.